A manhunt is under way for an anti-cop "survivalist" with mass-murder fantasies who is wanted in last week's deadly ambush of Pennsylvania state police barracks, authorities said today. 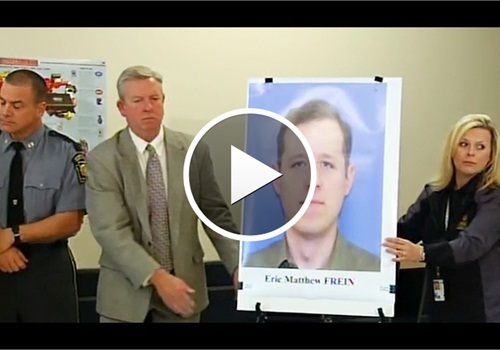 Arrest warrants have been issued for Eric Matthew Frein, 31, of Canadensis, Pa., for the Friday night shooting that killed one trooper and left another critically wounded. "He is at large and he is considered armed and extremely dangerous," Commissioner Frank Noonan said at a press conference. "He has been described as a survivalist...He has made statements about wanting to kill law enforcement officers and also about wanting to commit mass acts of murder." The gunman opened fire with a .308-caliber rifle on the state police's Blooming Grove barracks late Friday. Cpl. Bryon Dickson, 38, was killed and Trooper Alex Douglass was wounded before the suspect slipped off into the thick forest surrounding the barracks. A man walking his dog spotted a vehicle slightly submerged in a swampy area near the barracks and called police, who found Frein's ID inside — along with shell casings, empty rifle cases, military gear and camouflage face paint, NBC News reports. Police said shell casings in the car and casings found at the home Frein shared with his parents matched the ones from the barracks shooting. "He’s expressed anti-government leanings in the past, especially toward law enforcement, and he has survivalist training," the commissioner said.